Plus, age discrimination on the rise in job recruiting. Tips on protecting yourself from the top holiday scams. Why it’s okay to tap into your nest egg. And check out the best gifts that reap rewards long after the holiday season. WASHINGTON, DC—How can each of us keep our mind sharp as can be, for as long as possible? 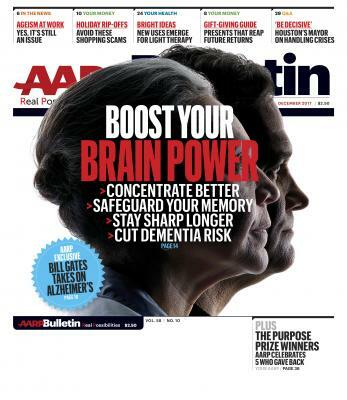 AARP takes on the question in the December issue of the AARP Bulletin, with a special report that provides a four-step guide to better your brain based on the newest, most exciting research. Learn how to help safeguard your memory (and which popular “memory boosters” have now been disproven), find out the most-recently discovered risk factors for Alzheimer’s, and get the newest thinking on how cell phones, computers and TV are rewiring our brains and affecting our ability to concentrate. Plus, revealing new research on a toxin-removal system that might be the fundamental clue to preventing brain disease. In addition, AARP Bulletin sits down with Bill Gates to discuss his new crusade to find a cure for Alzheimer’s. Age Discrimination Goes Online: Five decades after the landmark legislation to protect older workers, bias is on the rise in job recruiting. In this month’s issue, AARP Bulletin features a special report on how age discrimination is alive and well in the digital age, highlighting the top ways employers try to weed out older applicants and how older workers are going to court to fight these tactics. Season’s Cheatings: AARP Bulletin’s December issue provides a guide for the top holiday shopping scams and how to avoid them this season. From stolen packages to gift card fraud and postcard cons, learn how to protect yourself this holiday season. Is It Time to Splurge? : Do we become too frugal when we retire? Having a nest egg is great, but it doesn’t mean you have to pinch every penny and forgo joy later in life. In this month’s issue, personal finance expert Jane Bryant Quinn, reveals how to figure out exactly how much money you can afford to spend without putting your future at financial risk. Gifts That Keep Giving: The best presents grow in value and meaning long after the holidays end. So why not give your family gifts that reap ongoing rewards, inspire new interests and hobbies, or make tomorrow’s world a brighter place? We asked experts for gift ideas that continued to be appreciated over time, and created the perfect shopping list – from meal kits to the gift of time – to spark ideas this holiday season. Learn more at http://www.aarp.org/bulletin/. Interviews with AARP’s experts are available upon request. The definitive news source for AARP’s members, AARP Bulletin (http://www.aarp.org/bulletin/) reaches more than 23.5 million households each month in print, with additional news and in-depth coverage online. Covering health and health policy, Medicare, Social Security, consumer protection, personal finance, and AARP state and national news developments, AARP Bulletin delivers the story behind the key issues confronting 50+ America. The monthly consumer-oriented news publication has become a must-read for congressional lawmakers and Washington opinion leaders, and it provides AARP members with pertinent information they need to know.